This section describes how to monitor a MySQL instance. Select an Agent from the list of Agents to monitor this MySQL database Instance. It is recommend installing one Agent per Host and using that Agent to monitor all its MySQL Instances. Set up the Agent as a local connection by specifying TCP/IP and an Instance Address of 127.0.0.1, or use a socket file. If there is no local Agent on the Host and you are unable to install one, use the built-in or another Agent to monitor remotely. If the instance is monitored remotely, it is not possible to retrieve any information on the host. To monitor a host, an agent must be installed on that host. 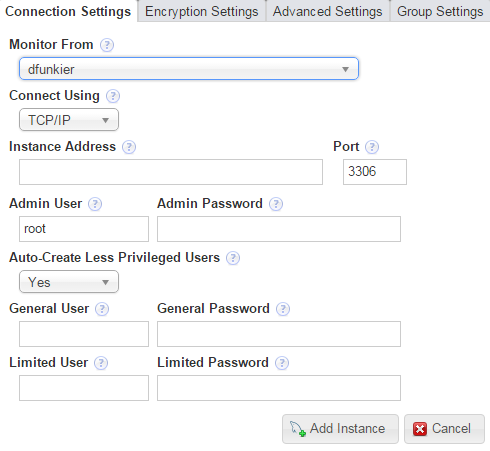 Select TCP/IP or a socket to connect to the instance. Socket connections can only be used for an Agent that is installed on the same machine as the target instance, and do not work with instances running on Windows. The IP address, or valid hostname, and port number the instance is listening on. If the host/agent chosen is local to this instance, you should use 127.0.0.1 here. The root user, or user with the privileges defined in Creating the Admin User and the password. 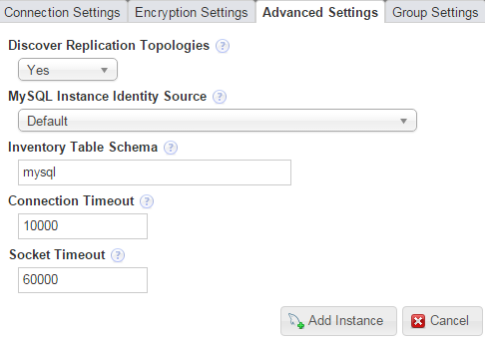 Choose Yes to create the General and Limited users on the MySQL instance. You must add a user name and password for both. For more information on these users, see Section 5.2, “Creating MySQL User Accounts for the Monitor Agent”. Choose No if you intend to use the Admin user for all data collection. It is strongly recommend to use the General and Limited user. Add a user name and password for the General User. Add a user name and password for the Limited User. Defines whether the connection uses TLS for security. 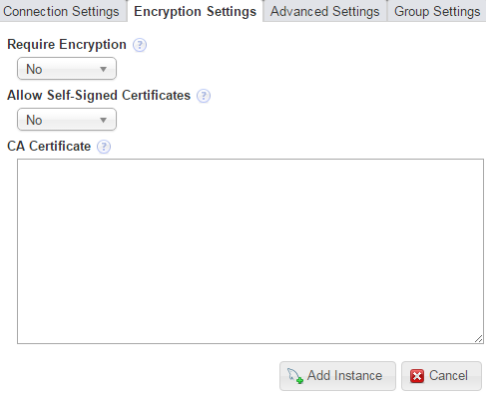 Specifies whether the connection permits self-signed certificates. Paste the CA certificate's contents here. This is not required if you are using a self-signed certificate. Specifies whether the agent attempts to discover if the instance is part of a replication group and discover the other members of that replication group. When performing replication topology discovery, the agent attempts to read the slave's master.info, and use the stored credentials to log in to the master to read its inventory table and retrieve the master's UUID. If set to No, no replication discovery is attempted. Host Plus Datadir generates a hash of the host identity and the path to the MySQL instances data directory to create a unique identity. Host Plus Datadir can be used only if the agent is running on the same host as the MySQL instance for this connection. When the Agent connects to the MySQL Instance, it creates an inventory table, if one does not already exist, and stores two rows within it: a generated Instance UUID, and the host ID. By default this is created within the mysql database. On shared hosts or cloud environments this may not be accessible to the Agent user; provide a database name to override where the inventory table is created. Connection timeout, in milliseconds, used by the JDBC driver. Socket timeout, in milliseconds, used by the JDBC driver. Enter the groups to which you want to add the instance. It is also possible to define new groups in this field. To add groups, you must have the Server Group permission set to Read-Only, at least. To create new groups, you must have the New Group Creation permission set to Administer.